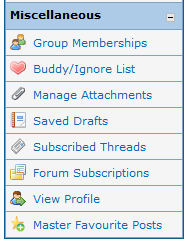 Allows member to add posts in their favourite list to view them whenever they wish. One can add posts in their favourite lists to avoid searching for them again and again. 1. Copy mfp_10_to_11.php on MYBB Root directory. 2. Access files through browser. 3. Click on Do Backup. 5. Delete old plugin files. 6. Upload new plugin files. 8. Back to mfp_10_to_11.php and click on Do Restore. 9. Check that old favourite posts are back into table. 10. Once confirmed, click on Do Cleanup. I know guys it might be little tedious but so far this is the quickest solution I could think as of now. 1. Upload the inc, images, jscripts folder & master_favourite_post.php to your MyBB installation directory. Configure the settings in your Admin-CP >> Configuration >> Board Settings >> Master Favourite Posts. In your Admin-CP go to Templates & Style >> Templates >> Global Templates and edit templates starting with mfp_%.